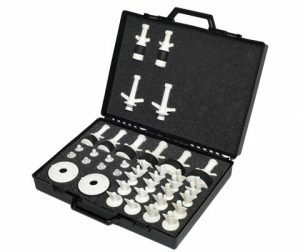 Kit includes Nylon Expansion Plugs from 1/2” through 4” sizes (includes fittings and caps) in a hard carrying case with custom foam inserts. Testing and sealing of all pipes, pipe joints and pipework assemblies can be done with the Nylon Pipe Plug Kits. Nylon Pipe Plug applications include sealing holes in castings, tanks, other assemblies for spraying and blasting to protect the insides, maintenance and installation of swimming pool and water spa pipework, for use as ‘Scupper Plugs’ in ships, for telecommunication pipelines and pipework up to 6″, as radiator test plugs for cars and commercial vehicles, as heat exchanger tube plugs, etc. Nylon Testing Plug Kits provide a high quality leak-tight seal in the selected orifice and are chemically clean, demountable, will not seize up. Nylon Pipe Plugs are low cost, light weight and easily transportable and provide very fast and effective sealing. Nylon Pipe Plugs are constructed of high-grade Nylon 6 which has considerable wear characteristics and makes them stronger and more robust than other plastic plugs. Nylon 6 is an engineered polymer which is resistant to salt water corrosion as well as to many other chemicals. A wide range of Nylon Test Pipe Plugs from 0.5 to 6″ (12 to 150 mm) for specific applications is available, such as Drain Test Plugs, Waste Test Plugs, Sewerage Test Plugs, Scupper Plugs and many more. Threaded central spindle, shaft or waterway onto which a top and bottom plate are mounted, with a rubber ring between them. Wing nut screws down onto the top plate which compresses the ring until the plug is sealed in the hole/cavity.